Why Do I Have Armpit Odor Now & I Didn't Before? Armpit odor usually first occurs in puberty, when sweat from your apocrine glands combines with bacteria on your body. According to WorsleySchool.net, armpit odor tends to get worse as you age. Many people begin using underarm deodorant or antiperspirant in puberty or early adolescence. Deodorants inhibit the bacteria that cause your armpits to smell. Your skin contains two types of sweat glands, known as eccrine and apocrine glands. Most armpit sweat comes from the eccrine glands, has no odor and serves the function of cooling the body. Eccrine sweat is mostly water and salt. Fresh apocrine sweat is also odorless, but when it combines with the bacteria found in 90% of male and 70% of female armpits, it causes body odor. According to MayoClinic.com, apocrine sweat is fat-based perspiration that is digested by the offending bacteria. Keeping your body clean becomes especially important as you enter the teenage years. You may find that you can't go as long without a bath or shower before your body starts to smell. A daily shower with hot water and soap may be enough to keep you smelling fresh, although you may need to shower more often if you are very active or tend to sweat a lot. If you are worried about body odor, try a deodorant bath soap. Antiperspirants contain aluminum to help block your sweat glands, preventing you from perspiring. If you don't sweat, it is likely that your armpits will not smell bad. Some people prefer not to use antiperspirants due to worry over aluminum content. Deodorant does not prevent you from sweating but does inhibit the growth of odor-causing bacteria. Natural deodorants contain ingredients such as sage, ammonium alum and baking soda. You may find that you need to reapply deodorant more often during the day than you do antiperspirant. Your diet may play a role in the aroma of your armpits. According to NaturalNews.com, changing from a diet high in refined and processed foods to one based primarily on whole foods such as vegetables, fruits and grains may reduce body odor. They recommend eating chlorophyll-rich foods herbs such as parsley, cilantro and mint. Hyperhidrosis is a medical condition in which your body sweats more than it needs to in order to keep you cool. According to MayoClinic.com, hyperhidrosis generally affects the armpits, hands and feet. Episodes of heavy sweating occur at least once a week without excess physical exertion. Causes of hyperhidrosis include menopause, low blood sugar and overactive thyroid. Treatments include prescription antiperspirants, Botox injections and in extreme cases, surgery to sever the nerves running to the sweat glands. Binghamton University: What Causes Body Odor? 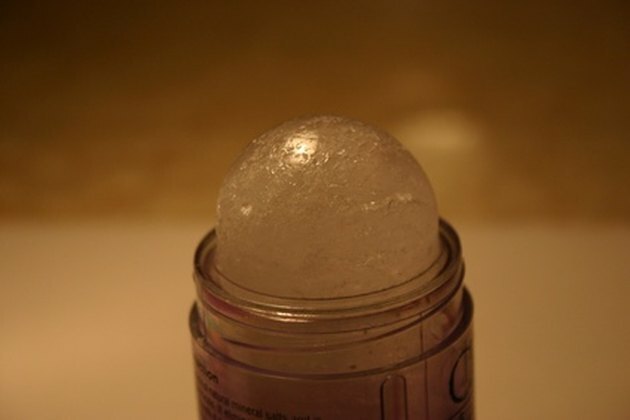 The Beauty Brains: Do Mineral Crystal Deodorants Really Work? What Causes a Sour Body Odor When Sleeping?